It just doesn’t get any easier to create this show stopping kid pleaser! 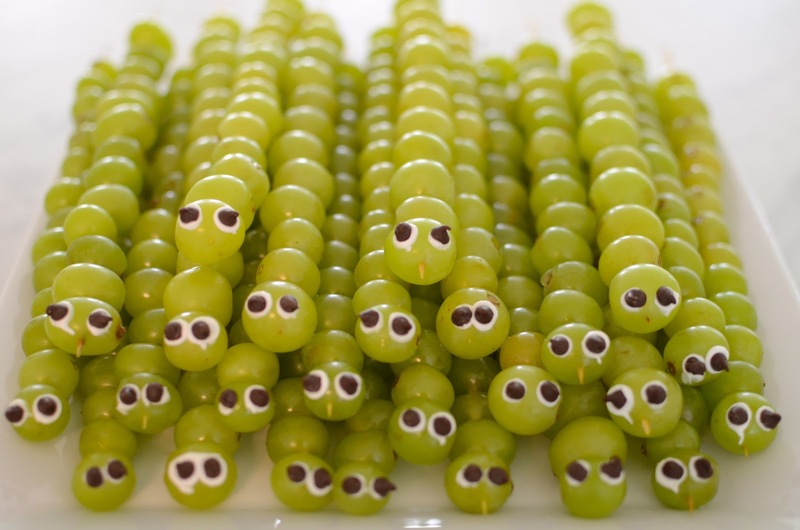 If you need to meet a wide variety of diet and allergen needs for a school party, you’ll score big with a tray of grape caterpillars. Simply skewer grapes on a straw while being careful to not fully skewer through the ‘head’ of the caterpillar. 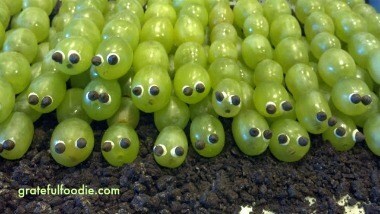 Make sure the head is dry, then add two small dollops of white icing to create the ‘whites’ of the caterpillars eyes. Add one mini chocolate chip to complete each eye. Serve on a bed of crushed chocolate cookies, and you’re done! The magic of this party favorite is that the fruit is the focus. This can be made top eight allergen free, vegan, Kosher and Halal very easily. The added bonus is that kid’s go wild for the whimsical dessert. It’s not everyday they get to eat caterpillars! Thanks to Caroline Moassessi, aka The Grateful Foodie for this post. Affiliate Disclaimer We are a participant in the Amazon Services LLC Associates Program, an affiliate advertising program designed to provide a means for us to earn fees by linking to Amazon.com and affiliated sites.